We love a good deal. 2 for 1, half price, reduced items – who doesn’t love a bargain! Call it in the immigrant instinct in us or something. Anyway, we spotted a leg of lamb on special offer and couldn’t pass it up. Normally, we would roast meat simply to allow us to use it in many different ways. This time, though, we threw caution to the wind – life is a celebration – well, our food life is anyway. We thought we’d make our raan instead – a heavily spiced, tender, slow cooked leg of lamb that we remember eating during our days in Delhi (on special occasions). Our favourite restaurant in Delhi, Bukhara does an unbeatable raan and although we’re too modest to say of course, this is a pretty good version. Oh and it makes so many portions, it could definitely feed a crowd (our next week’s worth of dinners). 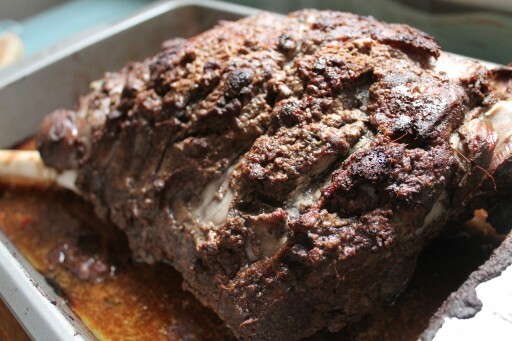 Place the leg of lamb in a roasting tin. Using the sharpest knife you can find, make deep cuts on both sides in a sort of criss-cross fashion. This will allow the marinade to penetrate into the lamb during marination and roasting. Using a coffee grinder or food processor, process the bay leaves, cinnamon sticks, brown cardamom, green cardamom seeds, peppercorns, cumin, coriander seeds and cloves into a powder. In a bowl, add this powder, as well as the turmeric, garam masala (for added oomph! ), red chilli powder, ginger-garlic paste, yoghurt, ground almonds and oil. Mix thoroughly so that you end up with a uniform paste. Now the messy party: spoon the paste over the leg of lamb and using your hands, massage the mixture into the lamb leg – all over, making sure you work it into the deep cuts you made earlier. Cover with foil and place in the coldest part of your fridge for roughly 24 hours. Preheat the oven at 200C (fan assisted). 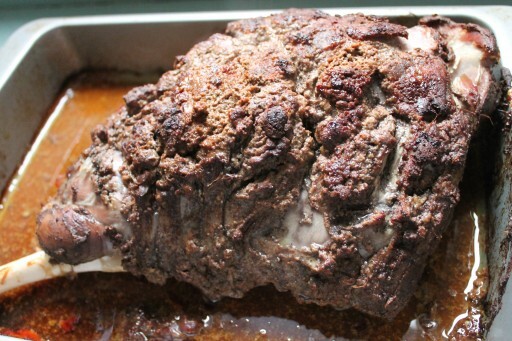 Place the roasting tin in the oven and roast for 2 hours and 15 minutes, or until the lamb is tender. Take the tin out of the oven and leave to rest on a wooden board for 30 minutes before tucking in. Enjoy with naan and feel like a Mughal king!